At 1900 Locust Street in the heart of downtown St. Louis, just two blocks north of Union Station lies our facility; Jim Edmonds Space 15. Among many, ours is one of the city's truly special venues. Also housed in our beautiful facility, is our most recently remolded restaurant called the Precinct. This warm, contemporary location offers 3 private rooms versatile enough to host small or large corporate events. We can easily accommodate birthday parties, rehearsal dinners, wedding ceremonies and receptions. Our private rooms can hold 50-250 guests with no room rental fees. Our flexibility and commitment to every guest's satisfaction, has proven Jim Edmonds Space 15 as a leader of events and event planning in St. Louis. For more information please call 314-920-1168. St. Louis native, Chef Ben Welch, began his culinary career over 20 years ago as a dishwasher at Webster Groves' Two Nice Guys. He rose through the ranks at various local establishments before deciding to attend Johnson and Wales in Charleston, SC in 1995. After culinary school and bouncing around, he moved to New Orleans in 1999 to work at Emeril Lagasse's Nola and mentor under Chefs Joel Morgan and David McCelvey and alongside a who's who of future kitchen leaders. 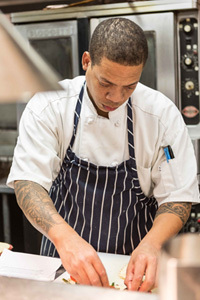 With his move back to St. Louis, Welch has worked with and under some of the city's top chefs. Throughout his career Chef Ben has held positions in the industry including Culinary Instructor to Caterer, and from casual to fine dining and hotels and back again. The most recent years has found Chef Welch investing more time working as a Chef Consultant and attempting to pen his first cookbook. Chef Welch is a current member of both the SLBS and the KCBS, where he is certified as a competition judge. Ben assisted with the openings of Home Wine Kitchen, Basso, the Restaurant at the Cheshire, and Katie's pizza and pasta.